Host Europe offers lots of features coveted by beginner and experienced customers alike, but there are significant drawbacks too. 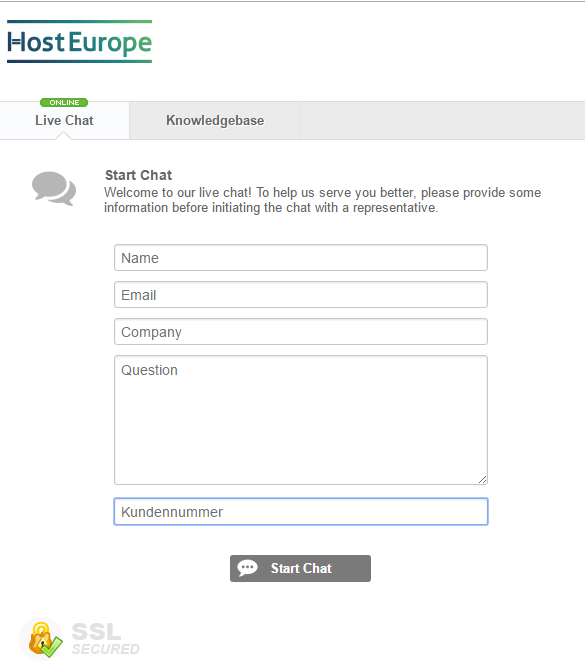 While 24/7 customer support, sustainability efforts and a promise of near-perfect server reliability are exciting, language limitations (the site and support are in English and German only) and issues with ease-of-use may prevent beginners and international clients from finding a happy home at Host Europe. Services, support and content are available in English and German. Plenty of value, with options that include no setup costs or contracts. Users can choose between a multitude of plans at every level. Customers can reach support via email and phone 24/7. Host Europe promotes green initiatives like renewable energy. The site is only available in German and English. Lack of cPanel might make it difficult for beginners to navigate the tech side of things. Support seems more tech-oriented and less concerned with customer service issues. Toll-free numbers only work in Germany, Switzerland, and Austria; users in other countries have to pay to call. While Host Europe has a wide array of services and features that provide great functionality for those savvy enough to figure out how to use them, getting there may prove difficult. The main page is available in English or German, but information pages such as the FAQ are in German only. This means that non-German-speaking users have to rely on an in-browser tool such as Google translate to learn how to navigate Host Europe’s system. The 24/7 support feature is helpful, but it has issues with language barriers, and the lack of a toll-free number outside of Germany, Austria and Switzerland could be problematic. A customer’s potential return on investment at Host Europe depends very much on expectations and the specific plan chosen. Someone with previous knowledge of site design can get started quickly and take advantage of advanced features at prices that won’t break the bank. On the other hand, a user who has relied on a cPanel and user-friendly platform design with other hosts might spend far too much time trying to learn the ropes and not find much value with any plan at Host Europe. Host Europe offers 24/7 phone support, however those lines are only toll-free in Germany, Austria and Switzerland. They also offer email and chat support, but when we asked a question via the chat function, we never got a response. The site does have a FAQ, which is packed full of interesting information. There’s also a knowledgebase, but it doesn’t appear to have any articles posted yet. 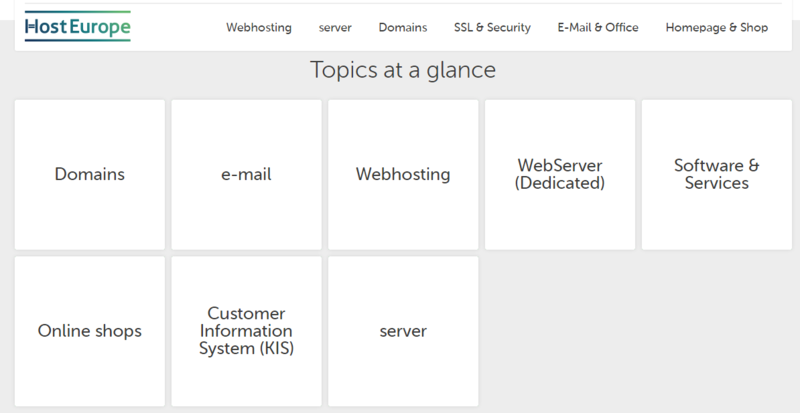 Host Europe’s packages range from bare bones to comprehensive. 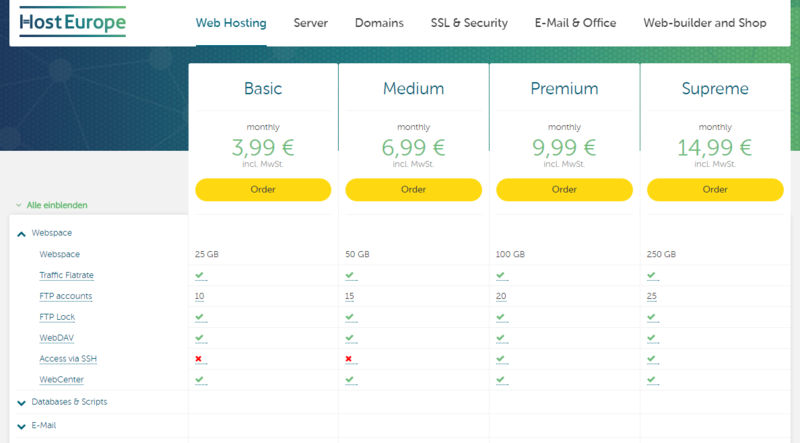 Basic user-run WordPress hosting packages are only pennies a day, but a dedicated server package (complete with 32GB of RAM and lightning-fast processing) are much more. The ability to chase success without hopping hosts is worth the money, though, and monthly billing cycles and 12-month contracts make it easy to upgrade anytime. Host Europe is all about the features, such as dedicated IP addresses, flexible e-commerce solutions, virtual Microsoft Office tools and so much more. Customers are protected by SSL certificates, SiteLock, daily backup service, and regular malware sweeps. There’s even a site builder, so businesses can get online quickly. Some features are automatic, but others require some work on the client’s side. Those who put in the effort will see functionality rise. Host Europe has packages for everything from start-ups to established companies, and customers in need of lots of business-hosting features might be happy here. Complete newbies may struggle with the tech side, but customers who are familiar with web hosting and who don’t need a cPanel should do well. If you need lots of customer support, Host Europe might not be your best bet. If you can figure some things out on your own, you have lots of room to grow.